Over the past 17 years, Rocket has completed more than 45 acquisitions, each of which helped to accelerate our growth. We acquire differently than many others, and we care about doing what’s best for our new employees, customers and partners. We have a reputation for being transparent and efficient throughout the acquisition process; we always do what we say we’re going to do. Terminal Emulation provides an essential link between users and their critical enterprise business applications, making this market strategic for Rocket. We have global customers in banking, insurance, healthcare, government and many other sectors. The acquisition of Zephyr expanded our Terminal Emulation portfolio, technical expertise, and customer base. We’ve continued to invest in this space, bringing new products and new value to our customers. We offer several solutions to help customers optimize and modernize their mainframe investments to meet new business challenges. The acquisition of the Shadow business has been a key component of our strategy for enabling mainframe modernization. Shadow technology forms the core of Rocket Data Virtualization, which allows real-time access to mainframe data for applications, analytics, and other use cases demanded by today’s business users. 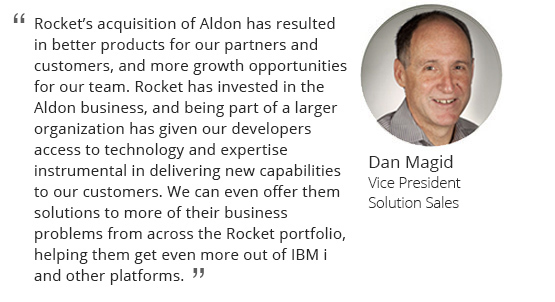 Aldon solutions help IT teams run the business of application development. Aldon automates everything from the moment a business request is received until it is delivered into production, with full audit tracking and compliance reporting. Aldon is a natural fit with our LegaSuite business. With the Aldon acquisition, we gained a robust DevOps solution to help customers manage their application development and deployment needs, including applications modernized with the LegaSuite product family. Both solutions are particularly strong on IBM i, and have helped us become one of the strongest players in the IBM i market. MultiValue (MV) is a unique, cost-effective, non-SQL application platform. In 2013, we acquired D3 and related products, adding to the strength of our existing MV portfolio. We’ve delivered new capabilities to our entire MV customer base, and also helped customers solve new business and operational challenges by integrating other Rocket products with MV. For example, we’ve integrated our DevOps solutions, Modernization solutions, and Business Intelligence solutions to help customers better manage, modernize and get more out of their MV investments. We look for products that customers have used to help run their business over the long term, and teams that care deeply about their customers. We focus on areas we know well, so we can quickly add value; particularly IBM Z, Power Systems/IBM i, and distributed systems. Most importantly, we acquire for growth–either growth today, or where there is a strategy to achieve growth in the near term.